What is Farm Camp Like? Do you like to explore outside and get dirty? Are you interested in learning about farm animals and helping with farm chores? Are you curious about the garden and how to grow food? At Hart-to Hart Farm we learn by doing and engage your child’s curiosity about the farm, garden and wildlife that comes from being part of our working farm. Each day, we start the morning off with circle time and stretching before heading out to do our morning farm chores. 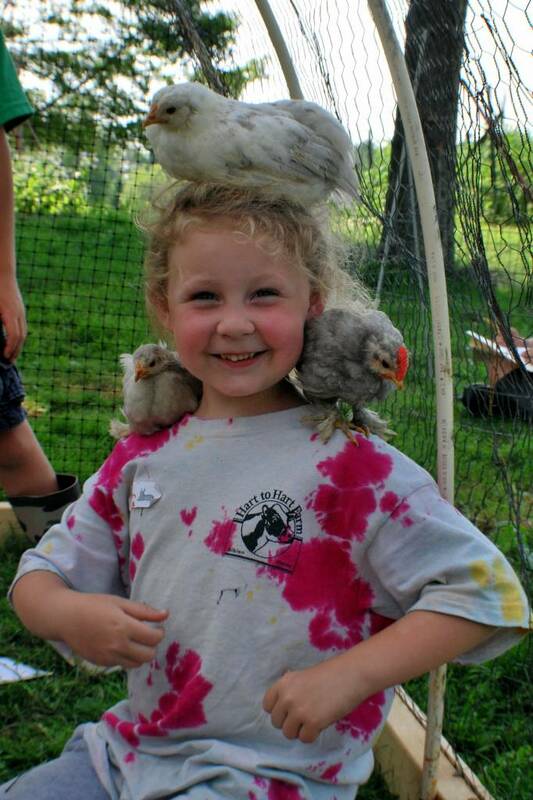 Following chores, campers spend special time training with their “adopted” animal. Then it’s off to explore and discovery the wonders of farm life through guided activities. The day ends with a closing circle and check in. With livestock barns, gardens, pastures, ponds and forest to explore, there is always something new to investigate every day. Camp days are full and campers end the day a little tired and dirty but with a smile on their face.ent goes here, click edit button to change this text. Our weekly sessions are Monday-Friday, 8:30am – 4:00pm, from June 19 to August 11, 2017. Will my child be fed at camp? Parents/Guardians provide lunch for all camp sessions unless otherwise indicated. We provide a healthy morning snack and encourage parents to send a healthy snack for the afternoon. Is Hart-to-Hart Farm Nut Free? Our program is small enough that we can accommodate your child’s need by creating a nut-free area or providing a nut free week. All campers wash their hands before and after lunch. Please indicate your camper’s allergy on your registration form. Contact the director if additional information is needed. How many weeks can my child attend? Your child can attend one week or multiple weeks depending on availability. Please check out our programs for availability in each week. Campers must attend the whole week. We have a number of generous donors who love farm camp and want all youth to have the opportunity for this rich experience. We award partial or full need-based scholarships. To apply for a scholarship download the scholarship application and send it with your registration. Scholarship applications must be received by Friday April 21st, 2017. Applicant will be notified by early May.